Hotel owner Ahlaam Mehle told the BBC she found countless carcasses on the shore of the Tanzanian island. The fisheries department has warned local inhabitants, who have begun to cut up the meat, not to eat it. Dolphins are populous in the waters around Zanzibar and attract thousands of tourists each year. 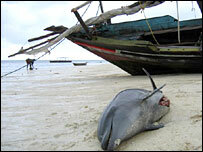 "It is a very sad sight," Zanzibar-based marine life expert Nariman Jidawi told the BBC's Focus on Africa programme. The dolphins - the tursiops truncatus bottlenose species that usually live in deep offshore waters - had totally empty stomachs, which rules out poisoning or oil pollution for the mass fatalities, she said. "It's a mystery to us. We know strandings occur, but we don't know what causes them. Maybe they got lost." Local residents say the north of the island has had strong winds and heavy rains, as well as big tidal water movement due to the new moon. By Friday afternoon, Mrs Mehle said there was a "heavy smell" coming from the carcasses strewn for miles along the northern Nungwi and Kendwa beaches. "The more you go along the beach towards the north-west the more you see. They are floating on the sea as well," she said. "It is alarming, this has never happened before," she said. It was not affecting her family's hotel business as it was the low season, she said. But the BBC's Alley Saleh in Zanzibar says there are fears it could impact negatively on the tourist industry of Tanzania's semi-autonomous archipelago.